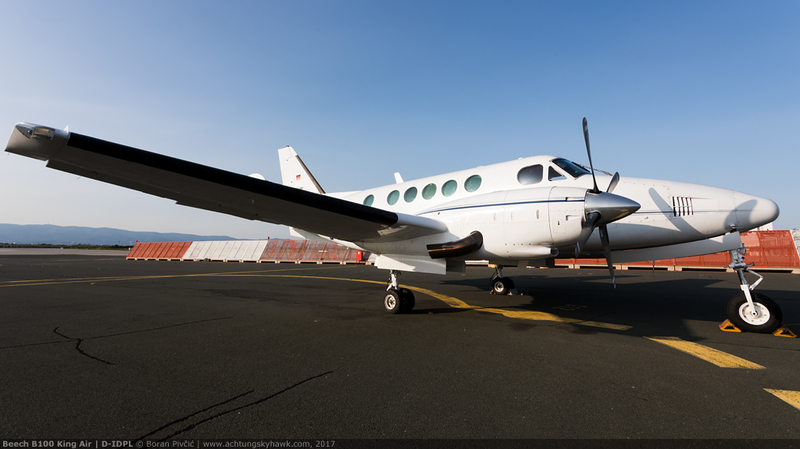 Rare Aircraft – Strikebreaker: Beech King Air B100 | Achtung, Skyhawk! 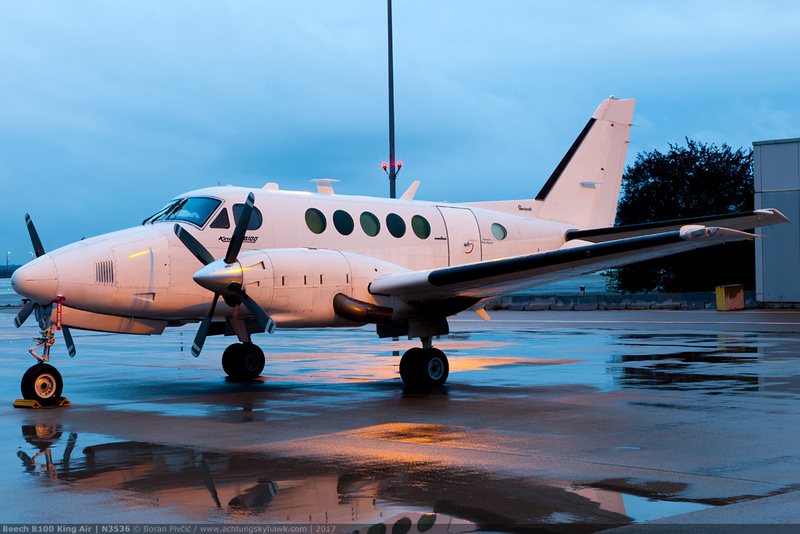 While it is a bit of a stretch to put the word “rare” next to “King Air” – the most ubiquitous light turboprop twin out there – there nevertheless is one member of the genus that first this description rather well: the nowadays mostly forgotten B100. One the one hand, it’s a 100 model (not one of the more common series to begin with! ), and on the other the only King Air variant of any sort NOT to use PT6A engines by default… all credentials that make it a fine subject for a short Achtung, Skyhawk! historical review (not to mention me having snapped two examples in the space of just four months 😀 ). Fortune favors the brave – or at least those willing to stand out in the wind and rain for a photo! The first B100 to ever cross my path, N3536 is seen waiting out a dreary night on one of Munich Airport’s (MUC/EDDM) northern GA aprons. Manufactured in 1978 with the serial BE-72, this machine has a life story worthy of an MD-80, starting out in life as N2830B, then becoming XA-OCI of Mexico, followed by YV-321CP of Venezuela, before eventually making it back to the States as N2425J and N20FL. Soon though it would head over for a spell to hot South Africa as ZS-MZS, followed by a stint in cold Canada as C-FAFE – and then finally back home for the second time as N3536. Well traveled it definitely is! In essence simply an evolutionary development of the original short-body model 90 (or more precisely the B90 variant), the 100 series came about in 1969, just five years after the type as a whole first went on sale. Its biggest selling point for the average Joe was a 1.27 meter fuselage stretch, allowing the new airplane to now accommodate up to seven passengers in addition to two crew, plus one more on a seat belt equipped toilet in the aft fuselage (sounds like a riot, but is actually a common solution on smaller executive aircraft even to this day 🙂 ). Outside marketing brochures however, the 100 had a lot more going for it than just extra space, including the wings, entire tail section and 680 HP PT6A-27 engines lifted off the B version of the model 99 commuter airliner – itself also a derivative of the same piston powered 65 Queen Air that had been the basis for the original King Air 90*. It would be these very bits that would give rise to some of the 100’s more interesting traits. Despite being a 15 seat airliner larger than any King Air before or since, the model 99 had had quite a small wing, just 14 meters in span and 25 meters squared in area. When fitted to the basic 100 and its 4,810 kg of Maximum Take-Off Mass (MTOM), this resulted in a wing loading of 192 kg/m2, significantly higher than the 167 kg/m2 seen with the 27 m2 wing of the 4,550 kg B90. Indeed, by the time the 5,350 kg B100 had been introduced, this had swelled to 214 kg/m2, in excess of any King Air aside from the current heavyweight 350ER and its 260 kg/m2. The upshot is that this makes the aircraft quite nimble and very efficient at high speed – but at the expense of pleasant low-speed handling, ceiling and climb performance¹. Bear in mind however that the difference between these figures is not so high as to make the 100 feel like a completely different aircraft; it just “likes to be flown” in a slightly different manner and gives its best when the crew plays to its specific strengths and bears in mind its specific weaknesses 🙂 . Another interesting feature that had made it over from the 99 are the rear flight control surfaces, particularly the type’s powerful wide-span tailplane. The model 90 used (and still uses in fact) a fairly conventional setup consisting of a fixed horizontal stabilizer and a separate elevator attached to its trailing edge. The 99 however went for an all-moving tailplane, in which the entire surface acts as the elevator, and there is no separate section solely for pitch control. While this does add complexity and a fair bit of weight, this system provides for significantly more powerful and efficient pitch control, increasing maneuverability – and, critically for any King Air, broadening the aircraft’s range of safe CG positions (which are dependent on elevator authority). This particular feature had made the 100 an outstanding utility hauler, since it was highly tolerant of cargo distribution, easy to balance and with plenty of control left over for getting out of tight spots – a foreshadow of things to come with the improved model 200 🙂 . But, despite having set the tough, no-nonsense-working-machine tone followed by all future King Air models, the 100 was never really a hit on the marketplace: only 89 would be made before production switched to the improved A100 in 1972. Easily distinguished by its four-bladed props and an extra cabin window on each side, the A100 differed underneath mostly by an increased MTOM of 5,215 kg and 360 liters of additional fuel capacity. Somewhat more successful than the base 100, the A100 would remain in production until 1979, with a total of 157 examples produced (making it the most… hmm… “common” of all the 100s). That may have been that as far as the 100 series was concerned had Beechcraft’s hand not been forced into action by events further up north in Canada. In January 1974, workers at Montreal’s United Aircraft Works – the place that bolts PT6As together – went on a 20 month long strike, during which all deliveries of new engines to Beech were suspended. Compounding a growing apprehension of relying on a single engine provider (as they still do now…), this event forced Beech execs to look elsewhere for a replacement and attempt to salvage as many sales of its flagship product as they could. With few options available as it were, in 1975 the company turned to the only other large American engine maker – Garrett – sticking its flat-rated** 715 HP TPE331-6 into the A100 to create the B100. ** intended to assure the engine delivers the same take-off power output regardless of air density, flat rating involves electronically limiting the engine to a lower HP than it can actually produce by design. On a “non flat” engine, the stated power is available at full throttle only in International Standard Atmosphere Sea Level conditions (ISA SL) – or, in plain English, at 0 ft altitude and a temperature of 15° Centigrade. Up the temperature or increase the altitude and the power output will decrease due to a drop in air density. To put it in numbers, an engine that produces 100 HP in ISA SL conditions may only produce 75 HP at 30° C or at 3,000 ft. This, of course, is far from ideal and tends to complicate flight planing and performance calculation. Flat rating gets around this issue (up to a point naturally) by using the excess thermodynamic capability of the engine to keep providing its rated power even in hot & high conditions. In the above analogy, the same engine would now be limited electronically to 75 HP even in ISA conditions… so when it gets hot and/or high, you still have its innate capacity to produce more power to meet that target. An additional benefit – especially on turboprops – is added torque, since the core of the engine is effectively “oversized” for the rated power it develops. Despite not having the 200’s majestic T-tail, the 100 is still a presence on the apron. This particular machine – D-IDPL, manufactured in 1977 under the serial BE-29 – had had a simpler (albeit more German) life than N3536, having so far only flown as D-IZAC, D-IERI and N7729B. While this was a successfully expeditious fix, it did not come without its problems. Despite its strengths – higher sea-level power and instant availability for installation – the reliability of the 331 had left something to be desired, falling short of what customers were used to getting from the PT6A by a noticeable margin. Additionally, its thermodynamic limit was only 840 HP, leaving just 125 HP to compensate for any drops in density. Indeed, flight testing had revealed that its could maintained its rated power only until about 6,000 ft (adding to existing climb performance issues of its short-span wing), while the ceiling on one engine was a low 11,000 ft. The maximum certified ceiling was still pegged at 31,000 ft like on the A100 – but the combination of aforementioned climb performance issues and cabin pressurization limits meant most spent their time in the lower 20,000 ft. There were some good news though; the B100 was 15 knots faster than the A100 at 10,000 ft (265 vs 250 knots at maximum cruise) – and up to 27 at 20,000 ft (262 vs 235) – and was known to be less of a drinker than the PT6A in all flight regimes. Thus, despite having come about as a stop-gap variant of what could almost be considered to be a stop-gap model – being a bridge between the highly successful 90 and 200 series – the B100 would enjoy a surprisingly long and productive life, with approximately 106 still being listed as still active in 2017. This longevity was partly down to Garrett and its successor companies (Allied Signal and Honeywell) who had kept beavering away at the engine and improving its reliability – and partly down to the spirit of fiddling and inspired improvisation that’s always been characteristic of American GA. Seeing that all what the B100 needed was a bit more poke and a touch of aerodynamic refinement, US after-market specialists wasted little time in offering various performance improvement packs for the aircraft, the most comprehensive of which involves the installation of TPE331-10 series engines, flat rated to the same 715 HP – but with a thermodynamic capacity of 1,000 HP. Combined with modern McCauley Blackmac five-blade propellers and drag-reducing winglets, this upgrade raises the B100’s single engine ceiling up to 15,000 ft, and allows it to easily pop into the mid-20s for cruise without taking an eternity to get there – all of which still makes it a worthy (and cheap!) alternative to the more expensive early and mid-production 200s 🙂 . The 100 family can easily be picked out in the crowd by virtue of its 200 series size and general 90 series tail configuration – while its large horizontal stabilizer will be an instant giveaway of the 99’s heritage. Recognition features of the B100 itself are chunky side-mounted exhausts (due to the straight flow nature of the TPE331²), as well as propellers that are not feathered on shut down. A detail that will escape the eye are slightly raised engine nacelles, a necessity to cancel out various aerodynamic moments caused by the extra power and different airflow patterns of the TPE331. However, despite the example set by my luck, finding one in Europe is a bit of an undertaking, with most surviving examples residing across the Pond in the US and Canada. Their final tally stands at just 388 produced, including the five A100-based U-21F transport models based completed for the US Air Force in 1971 (all grouped under the U-21 Ute designation applied to the 90 and 100 series). ¹ an additional long-winded explanation at no extra cost: wing loading is a measure of the amount of lift a meter square (or foot square) of the wing has to generate in order to support the airplane’s mass. The amount of lift that the wing CAN generate is operationally dependent on only one parameter: speed (and the use of high lift devices such as flaps and slats – but since these cannot be used in all regimes of flight, we can discount them for the purpose of this discussion). On a wing with a high loading, each unit of its area has to support more mass, thus it has to produce more lift – and the only way it can do that is to travel faster. This means that the aircraft’s minimum flight speeds will be higher, which is of particular importance during take-off, landing and low-speed maneuvering. Another side effect is reduced climb performance: since optimal climb speeds are also higher, more engine power has to be expended to maintain them, leaving less available to counteract the effects of gravity. This directly also limits the ceiling, since the drop in air density and consequent loss of power in the climb mean the aircraft will now run out of excess “puff” at a lower altitude. Something similar also happens at the other end of the altitude band: down low. The higher minimum speeds also mean that any maneuvers require more energy and more engine power, especially at high bank angles where the short span wing has to work extra hard (i.e. fly extra quickly) to generate enough lift to keep the aircraft in the air. Stalling speeds are also higher, while the small span – and the consequent lack of large area to generate lift – mean that the stalling angle of attack will be lower. However, the reduced span – which causes this whole loading issue in the first place – does have its advantages. Being short, the wing will produce less dampening when the aircraft is disturbed in the roll, since the restoring moment any rolling movement generates at the wing tip – the force that wants to return the aircraft to its previous stable state – is acting on a short moment arm and will have less effect overall. This in turn makes the aircraft more maneuverable, since a lower force is needed to overcome the aircraft’s natural stability (though this also makes it tiresome to control in turbulence). Another plus point is reduced total drag at high speeds, allowing greater velocities to be reached for the same power – or the same velocity for lower power and a lower fuel consumption. ² the root cause of all of the B100’s visual specifics is the internal layout of the TPE331, which – unlike the PT6A – is straight flow. In this setup, the air for combustion is inducted at the front of the nacelle, compressed in the “normal direction” and shot mostly in a straight line rearward into the combustion chamber. Once done in there, it passes across the turbines and is exhausted out the back like on your run-of-the-mill jet engine. The PT6A however employs what’s called a reverse flow layout, in which the engine is essentially mounted back-to-front in the nacelle. Here the air is first ducted underneath the engine core and then reversed into the compressor (which is located at the rear), delivered to the combustion chamber in the direction of airplane travel, passed over the turbines at the front of the nacelle – and then ejected out through ducts located just aft of the propeller. Which configuration (and engine) is better is pretty much the PC v Mac, Android vs iOS equivalent of the GA world, an endless see-saw battle of efficiency statistics, maintenance costs and power/fuel consumption curves… the resolution of which is far, far beyond the scope of this piece 🙂 .